One week before the next Mars mission is due to land, NASA has chosen the landing site for its next next Mars mission. Jezero Crater will be where NASA’s yet-to-be-named rover will land on Feb. 18, 2021, the space agency announced today. “It’s a Thursday,” said Allen Chen, who’s leading the entry, descent and landing team for what’s currently known as NASA’s Mars 2020 rover. That touchdown is due to come seven months after the mission’s launch in mid-July 2020. 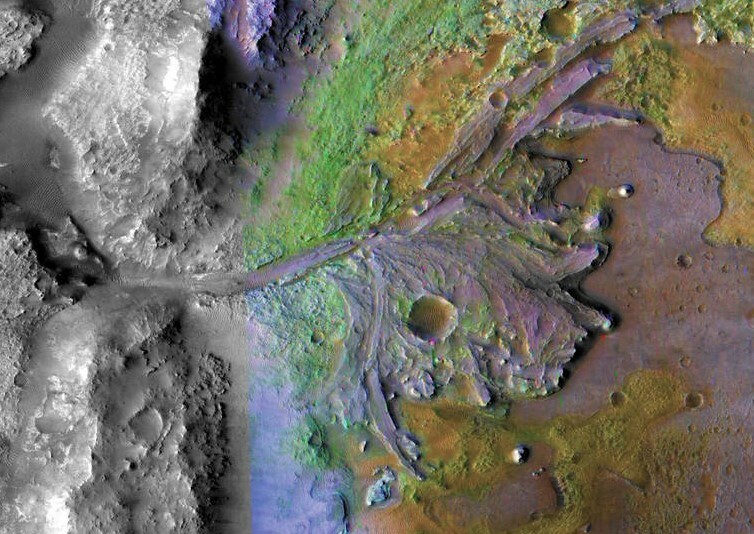 Jezero Crater is thought to be the site of an ancient river delta on the western edge of Isidis Planitia, a giant impact basin just north of the Martian equator. Scientists say the 28-mile-wide crater’s rocks and soil may contain organic molecules and other traces of microbial life from the water and sediments that flowed into the crater billions of years ago. This entry was posted in GeekWire and tagged 2020 rover, Mars, NASA, Space. Bookmark the permalink.